We’re so confident we can improve your current paid search marketing results that if you give us a chance to manage your PPC Campaigns we’ll reward you by waiving the first month setup fee. That’s right, the first month is on us. It’s a $750 value that you’ll get absolutely FREE*. But we aren’t stopping there. 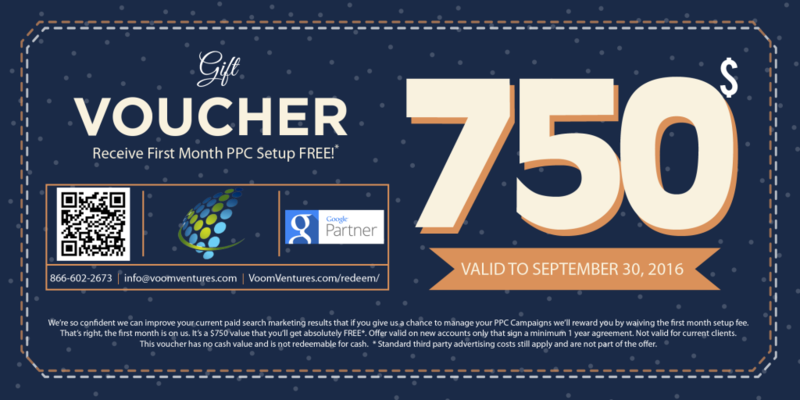 We’re also giving all new clients a $100 Google Advertising Credit when you sign up with us. That’s $850 in total advertising completely FREE. We consistently outperform even the largest agencies and here’s why: unlike many agencies who use programmed systems to put your account on auto-pilot and adopt a “set it and let it” mentality, we use real humans who “touch” each account by hand on a regular basis. We dig deep to find answers and opportunities and then take advantage of them before they take advantage of you. Human logic, systematic reasoning, and out-of-the-box thinking, is no match for a machine programmed to only react to numbers alone. Our hand picked team of the most talented PPC experts are passionate about delivering amazing campaigns that produce high ROI—translating to more profits for your business. We don’t just ‘drive traffic’ and measure clicks like many others. Instead, we work tirelessly using our proven process, to seek out and target only the most qualified visitors who have a burning desire to buy your product or service. The result is higher conversion at a lower cost. In fact, many of our clients enjoy average ROI’s ranging from 300% to 1300% while working with us over time. Regardless of whether you’ve tried paid search advertising before and had little success, we constantly deliver jaw dropping results for our clients that others can’t; while managing monthly spends ranging from $500 to $25,000. Our simple flat rate tiered investment structure makes it possible for companies of all sizes whether it be small, medium, or enterprise level to find success with us. Get a Proposal to Supercharge Your PPC Marketing Today! Ready to supercharge your PPC Marketing and get up to $850 in FREE Advertising at the same time? Complete the form below and we'll email you a proposal that will help you save money on your advertising and increase conversion at the same time. * Offer valid on new accounts only that sign a minimum 1 year agreement. Not valid for current clients. This voucher has no cash value and is not redeemable for cash. Standard third party advertising costs still apply and are not part of the offer.